Once again, I had the privilege of being interviewed on Fighting for the Faith by Pastor Chris Rosebrough of Pirate Christian Radio, and we not only had a good discussion on creation, evolution, Question Evolution Day, the folly of theistic evolution, and theology, but we also had some fun with it. He said he asked me back. Although after last year's interview he said he'd have me back, but I wonder how much of it is because I "reminded" him of it a few times. Hearing this back, I realize that really need to get a new microphone. I had a passel of notes ready to go, but only used some of them. It's just as well, I had the bit in my teeth and Chris had to say whoa more than once. (The reporter I had a phone interview with the other day also found out that I like to talk on these subjects, that went for an hour.) I had some references that his regular listeners will catch, plus a couple of Monty Python remarks. Pastor Rosebrough clarified something for me, and I think you'll get a short but important theology lesson from him in this interview. We discussed celebrating Question Evolution Day. Pastor Rosebrough suggested that we have a meal. 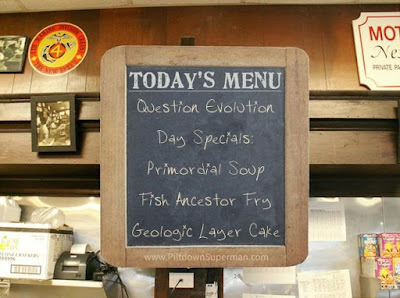 My wife and I are having (primordial) soup, (ancestral) fish fry, and (geologic column) layer cake. There's another very appropriate idea for dessert, but neither of us are interested in that. Made this using a chalkboard menu generator. It's interesting how both of us are working in parallel on some things, which includes dealing with bad reasoning and "proof texting" (in evolutionary science, the Darwinistas use "cherry picking"). Both of us also use snark to some extent, and I appreciate Chris' recommendation of Pastor Hans Fiene's message on the use of it. Some things I brought up are definitely worth mentioning here in addition to Question Evolution Day. Christian churches need to take a stand for biblical creation and against compromise by having Creation Sunday, click here. Second, there are legislators in the US that want to establish "Darwin Day". Not hardly! Secular humanism is already creeping in as the established state religion, against the Constitution, and making a Darwin Day just makes this establishment of religion more blatant. Check out "Stop Darwin Day" for more information. Am I already in trouble for making waves on a government religious holiday? Also, I told him about the fabulous Christian rock parody band, ApologetiX. See their excellent video "Monkeys for Uncles", below. Jumping ahead, after the interview was Pastor Rosebrough's review of a heretic's "sermon". Interestingly, there were some things I saw in there that go back to Genesis. The hyper-faith sidewinders emphasize the power of your words to speak things into being, and they often refer to creation week: God spoke, and it was so. Now you speak and "release your faith". Except that I have never seen or heard of someone causing something to appear from nothing. (Well, some atheists say that everything came from nothing, but that's their blind faith masquerading as science.) When people hear that stuff, they need to slow down and check the claims with the Word in context. All right, I've run on at my unregistered assault keyboard long enough. If you've a mind to hear the podcast, click here to listen online or download. On my browsers, I right-click on the part that says "download" and save the MP3 that way.